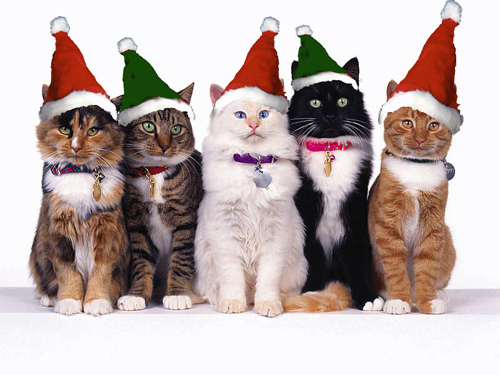 Happy Holidays from the staff at Haven Animal Hospital!!! We hope that your holidays are wonderful and safe. 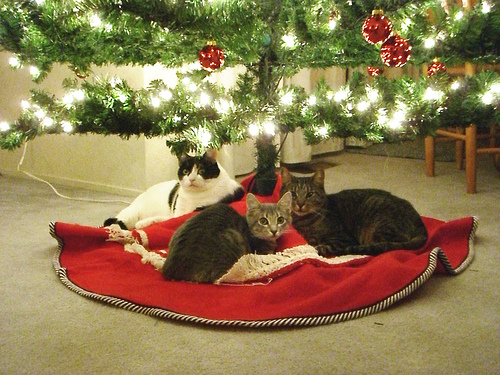 There are many hazards that are available to our animal companions during the holidays. 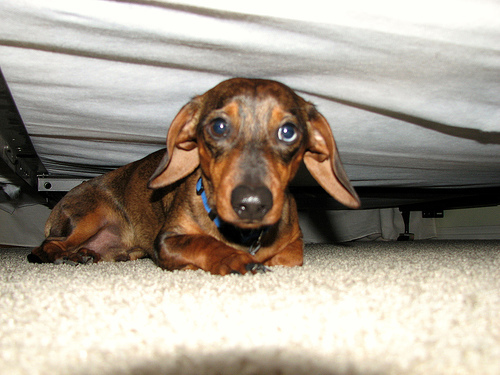 It is important to recognize these hazards and minimize the risks to our furry friends. 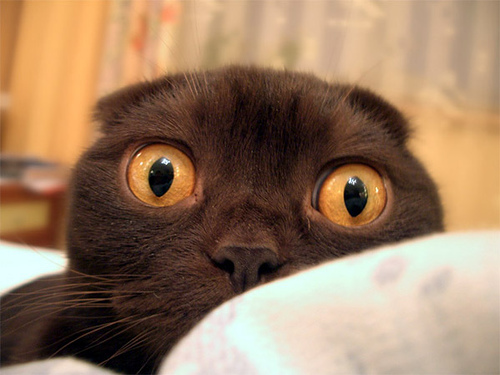 Dogs and especially cats are curious during the holiday season. Many of us decorate the interior of our homes and don't realize the dangerous nature of this process. Here are some of the hazards that you should be aware of so that you can take the precautionary measures to ensure your animal companion has a safe and happy holiday season too. Holiday Trees Make sure that your holiday tree is secure. Cats are notorious for climbing holiday trees. 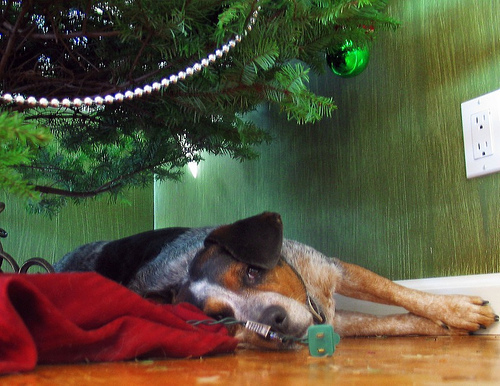 Dogs love to lay under the tree and if you have a large dog, these dogs can knock the tree over easily. It is best to secure the tree to a wall with a cord, rope, or chain. 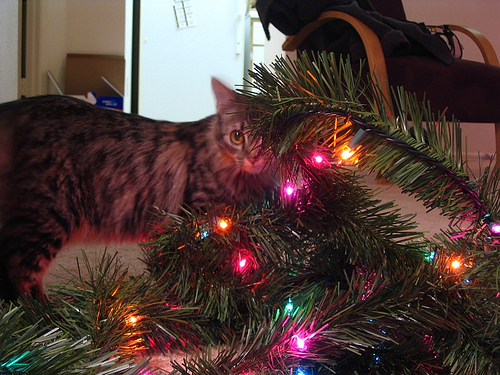 If you have a real tree, not artificial, it is important to prevent your animal companion from drinking the water. The water can be contaminated with preservatives and this can cause stomach upset resulting in vomiting, diarrhea, and anorexia. Also, pine needles from a real tree can cause injury and stomach upset if swallowed. Tree Decorations Many decorations are potential hazards. 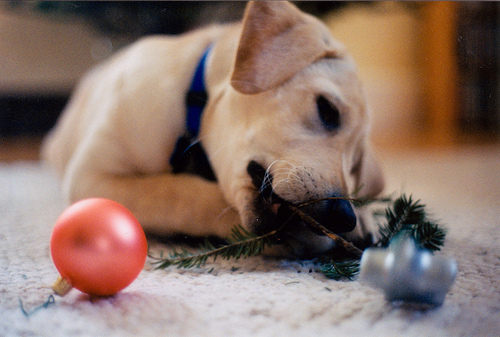 Breakable ornaments, such as glass, porcelain, and ceramic, should not be used, as our animal companions will often play with these and they can break them which can lead to serious injuries if swallowed, chewed on or stepped upon. Tinsel, garland, ribbons and icicles should not be used as ingestion of these can result in a linear foreign body which is an emergency surgical situation. Tree lights pose many hazards. Often times our animal companions will chew or bite the cords, bite the bulbs, or pull the strand and potentially pull the tree over. Holiday Plants Tradition teaches us that holly and mistletoe should always be included in our holiday decorations. However, both of these plants are extremely poisonous to our animal companions when eaten. If you must have these in your home, please make sure they are located where your animal companion can not come into contact with them. 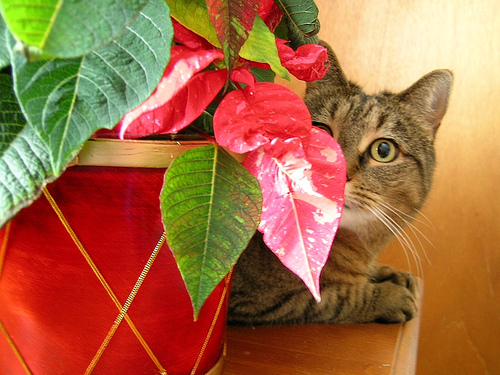 Poinsettas are not poisonous but can cause stomach upset as well. Candles and Potpourri Ambiance. We all love the wonderful smells of potpourri and the elegance of candles. Potpourri can cause extreme stomach upset when ingested. In oil form, it can potentially be fatal upon ingestion or inhalation. Candles are an obvious fire hazard and should be placed in areas where your animal companion can not reach them or knock them over. Holiday Meals Turkey, ham, pies, and many other wonderful foods will fill our tables this holiday season. Many of these succulent dishes should not be shared with our animal companions. Ham, and all other pork products, have high fat content and upon ingestion can cause pancreatitis, vomiting, diarrhea, and stomach pains. Turkey can be fine as long as it is not fried, seasoned, or raw. 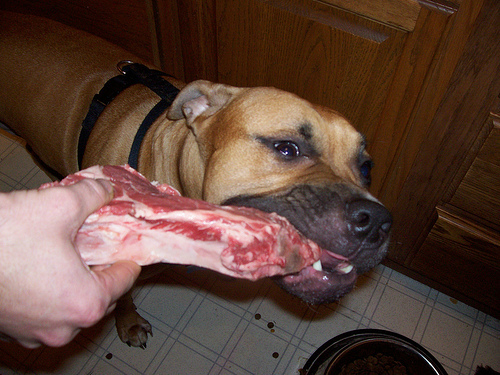 Bones should never be given to animals, especially poultry bones, as these can splinter and puncture the esophagus, stomach, and intestines. Celebrating the holidays with your animal companions and filling the home with wonderful smells of special prepared foods makes many of us want to share our meals with our pets. It is better to purchase a special flavor of canned dog or cat food and give it to your companion rather than to share your own meal. Also, many animals will drink alcohol and obtain a hangover, or worse. 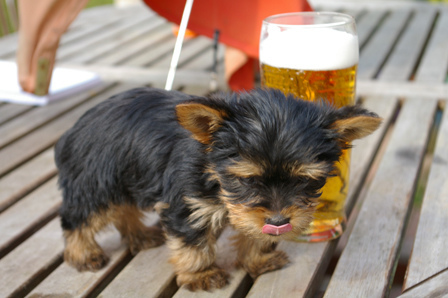 Make sure that all alcoholic beverages are kept away from your animal companion. Holiday Guests It is important to remember that while we are extremely excited about family, friends, and neighbors visiting for the holidays, our animal companions are not always excited in a good way. We have already altered their familiar surroundings with decorations, changed the smell of the interior of their home, and now we are having strangers (to them) over. There will be music, singing, laughing, and many other noises not familiar to them. It is extremely important that you provide a "safe place" for them to retreat, such as a bedroom or other room which will not be visited by guests. It is also important to make sure that their normal routine of feeding, walking, and sleeping is as near normal as possible. There are many other hazards not mentioned here, but please remember, our animal companions share our home, and they want to enjoy the holidays, too. It is up to us to make sure they have a safe and wonderful holiday season as well. season and hope it is a magical experience for you and your animal companion.